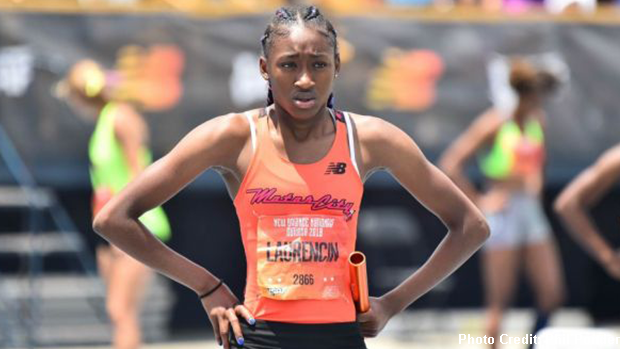 Aasia Laurencin had an emphatic close to her 2018 outdoor season at last week's AAU Junior Olympic Games, which were held at Drake University in Des Moines, Iowa. The rising junior from Oak Park competed in a number of events, but her overall experience was highlighted by the resounding win that she took in the 15-16 division 100m hurdles final. Her time of 13.75 was well clear of the 14.39 effort produced by the race's runner-up (Tierra Davis of the Stockton Saints). Laurencin actually ran a slightly faster time in the preliminary round (13.72) to position herself as the top seed heading into the final. Interestingly, her winning time was faster than the first place finisher in the girls 17-18 division 100m hurdles final. That contest was won by Christina Warren (Schwenksville, PA) in 13.79. Laurencin, who was representing the Motor City Track Club, has been a member of several championship teams with her club and high school and her latest individual honor complements the 200m title that she captured at this past June's MHSAA State Championships LP-1. The New Balance Nationals Indoor, New Balance Nationals Outdoor and Brooks PR Invitational veteran has also demonstrated impressive performances in the 60m, 60m hurdles, 100m and team relay competitions over the last few years. MileSplit connected with Aasia to learn more about her experience in Des Moines. Describe the 100m hurdles final. Before the race, I was really pumped up and ready to run. My coach (Brandon Jiles) told me not to think about setting a record because he felt that if I ran my race then the record would come. I had a really good warm-up and added a 5 minute jog because I was feeling a little sore. Then I did my regular drills, hurdles drills and sprints. When the officials checked us in, I didn't realize that it would be a good 10-15 minutes until I ran. When I finally did get to the line, my muscles were not as warm as I wanted them to be. While I was waiting to run, I kept doing high knees and sprint outs. My hurdle coach, Robert Lynch always tells me before every race to stay warm and get to the first hurdle first. I was a little nervous before the race because my body was getting cold and due to this - I knew it would be difficult to run my fastest. When the gun sounded I got out well, but not as fast as I wanted to. In order to make up for this, I started running faster and faster between the hurdles. I was a little disappointed that I didn't get the record (13.55), but I am very grateful that I ran a good race and that I earned my first individual national championship title. What kind of training did you do in lead-up to the Junior Olympics? Explain your overall experience and highlight what it means to have competed against many of the country's top athletes. It was a great experience at Drake University. This was my third AAU Junior Olympics Games and every year it keeps getting better and better. I always seem to come back with one more medal every year and this year, I was excited to win four medals (100H - 1st, 200 - 7th, 100 - 8th and 4x400 - 7th). The AAU Junior Olympics is always fun and the summer season is my favorite. It did not disappoint and I can't wait to go back next year! Aasia Laurencin also excels in the sprints and team relay events.